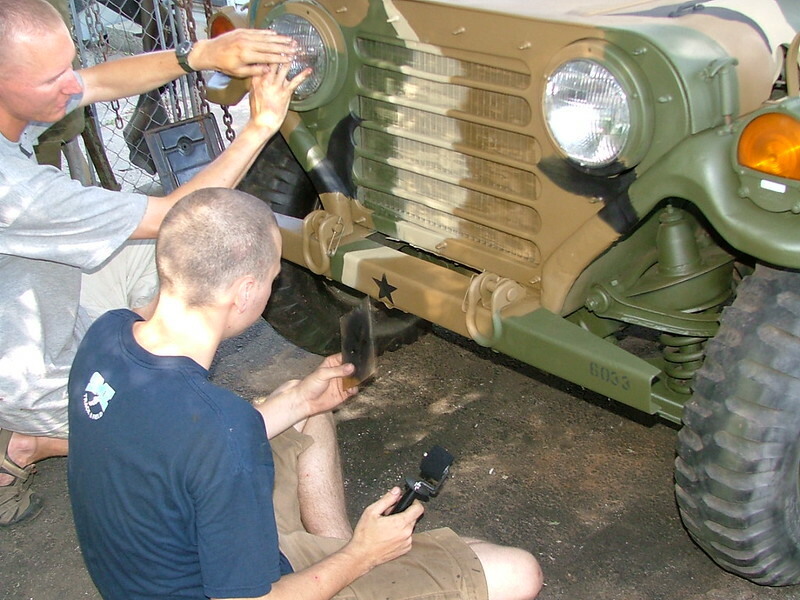 G838 Owner's Club • View topic - US Army Stencil Paint - What's Best To Use ? US Army Stencil Paint - What's Best To Use ? Wonder if anyone can help me....? I'm purchasing US Army stencils for my MUTT Jeep and wondered if there is a particular spray paint that is recommended for this purpose ? The Stencils I was looking to buy appear to be made of thick paper or card and are simply taped into position and spray painted, but presume there must be some sort of correct procedure for doing this ? 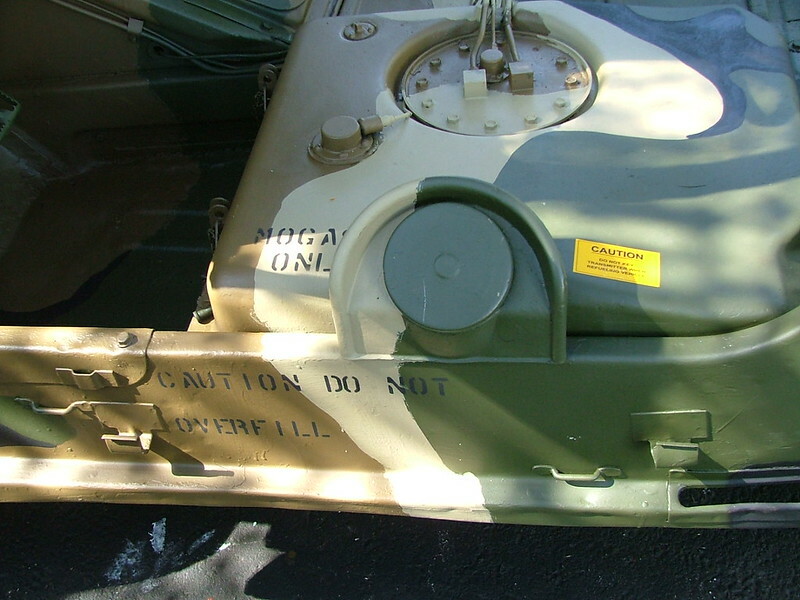 Re: US Army Stencil Paint - What's Best To Use ? The tighter you get that stencil to the body the crisper your letters will be. Although I have never done it I have heard of people spraying the back of the stencil with contact cement to hold it tight against the body. I would experiment with some similar material and see how hard it is to get off, you do not want to have to scrub on new paint. A thin rubber cement would be perfect but I am not sure it would keep the stencil in tight enough against the body. Just some suggestions too think about. Hi Rick, thank you for your advice - I'll have to think carefully about applying the stencils and I'm also amazed at how straight the Army seem to get the stencils when originally applied. Nick, I've used paper stencils and the technique I used was to wet the paper so that it adheres temporarily to the hood or body. I then dabbed the stencil with a tissue to dry up any water on the surface of the area to be sprayed. Next I used the aerosol can (shaken well and warmed in a bucket of hot water) and sprayed light coats, allowing each coat of paint to dry before applying the next spray coat. The paper stencils were then simply lifted off......no overspray, no spray going under the stencil. The question is... how thick is the paper on your stencils? If it is waxed oilboard or thick card, you'll struggle to form it to the curved surface of the hood etc even if you wet it. Use ink, and roll it on. Works great for us Kansas City guys. It also wipes up/off with rubbing alcohol, so if you screw it up, or want to change it it comes right off without messing up your paint. Rick Larsen makes paint mask stick on stencils that make the underspray problems go awawy. If you arent careful as Ken says you can get in to messy lettering. 3M spray adhesive on the back side of the oil board stencil. It is made for just this purpose, also will adhere permanently if you want, different variations. Available at Home Depot. You spray it on the back of the stencil let it sit for 1 min or so (read directions) then it drys to the point of just being sticky, then put the stencil on the vehicle. Mask area, paint, remove. Remember these are the people who make "post it notes" so it is the same function. I have done this to EVERY vehicle I have owned in the last 10 years. Take your time when you spray.... spray one light coat let it sit a few min then another let it sit. etc..... If you try and get perfect coverage in one spray you will get pooling of the paint on the bottom edges of the stencil. 44 M19 Dual 40mm "tank"
Could you give me the 3M No on the Adhesive Spray Can which you used for applying the stencils, much appreciated.